Although it doesn't sell like the Toyota Prius, Honda's Insight is staking out a space of its own. The 2013 Honda Insight hybrid offers a sleek and modern 5-door hatchback design, advanced powertrain technology and a sub-$20,000 price tag. Even though its performance is modest, the Insight's EPA estimated city/highway fuel economy is a miserly 41/44 mpg. Many features to improve driving experience. My car has no problems to date. It performs perfect.ly still and is very reliable. I have had no issues, and I drive quite a bit. It is comfortable due to a majority of the seat being cloth and not getting too hot. It is very spacious for a small car, and the cargo space is impressive. Cruise control, AUX capabilities, and the Bluetooth feature make it easy to use. Great Gas Mileage needs a few more frills. The gas mileage is solid, about 36 mpg in town and can get 45-50 mpg hwy. Seating is a little cramped, but not terrible. Lots of usable space in the hatch. Lack of available cruise control a real bummer. Some problems with the upholstery puckering. Overall, a solid care in the Honda tradition, no mechanical problems. Going down hill in VT I did 60 mpg on mount Washington NH as well. I enjoy the comfort of my insight. My insight is a hybrid so it is very quiet and gas mileage is good for long distances. It has a nine gallon tank that can go as far or farther that a 15 gallon tank. If I were to get this car new I would have gotten a few more amenities. 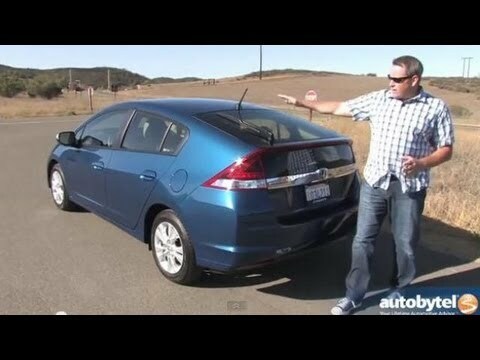 2013 Honda Insight thoughts, feelings after 1 year of ownership. Purchased in 2014.